There are many things that make Bend unique. Endless sunshine. A spellbinding volcanic landscape. More breweries than you can shake a pint at. But it goes beyond that into the little idiosyncrasies of our language and the things you will (and won’t!) hear folks say around here. Before someone takes me to task in the comments, I’m not saying no one has ever uttered the following phrases in Bend, Oregon. Heck, I might have said one or two of them myself. But your odds of hearing them are a whole lot smaller in Bend than in most other places around the country. If you’re a recreation enthusiast who loves hiking, biking, kayaking, and skiing (all before breakfast on a good day!) you’ll find plenty to keep you busy in Bend. But if a lazy Bend vacation is more your style, we’ve got you covered there, too. No excuse for boredom – there’s always plenty to do when you’re in Bend! Pretty much any end of the entertainment spectrum is covered in spades when you’re in Bend. Love culinary adventures? Yep, we’ve got that. Crazy about arts and culture? We give you the Roundabout Art Route, the Tin Pan Alley Art Collection, and an endless array of other artsy options like galleries, theaters, art festivals, museums, and more. If you’re in Bend and you’re bored, you need to seriously reevaluate your life. Like make sure you have one. Have you checked your pulse today? I thought of this the other day when someone on our Facebook page (150,000+ page fans and counting!) asked if Bend is as rainy as other well-known cities in Oregon like Portland and Eugene. At first I thought the guy was joking. Then I remembered not everyone knows how dramatically different Bend’s weather is from the rest of the state. The high desert oasis of Bend sits at an elevation of 3,600 feet, and we have the Cascade Mountains blocking most of the weather moving through from the west. What does that mean for our weather? Hot, dry, summers with endless blue skies. Chilly winters with lots of powdery snow and the aforementioned blue skies. Spring and fall with wildly-fluctuating temperatures that can leave you bundling up for a 36-degree morning and then flipping on the air conditioner by 3 p.m. when temps climb into the 80s. And did I mention the blue skies? Yeah, we get those pretty much year ‘round. There’s nothing fun for kids to do. Bend has plenty of fun things for kids to do! I have a 14-year-old stepson and a 9-year-old stepdaughter, and I don’t think there’s been a single moment in the five years I’ve known them that we’ve struggled to come up with something fun to do. 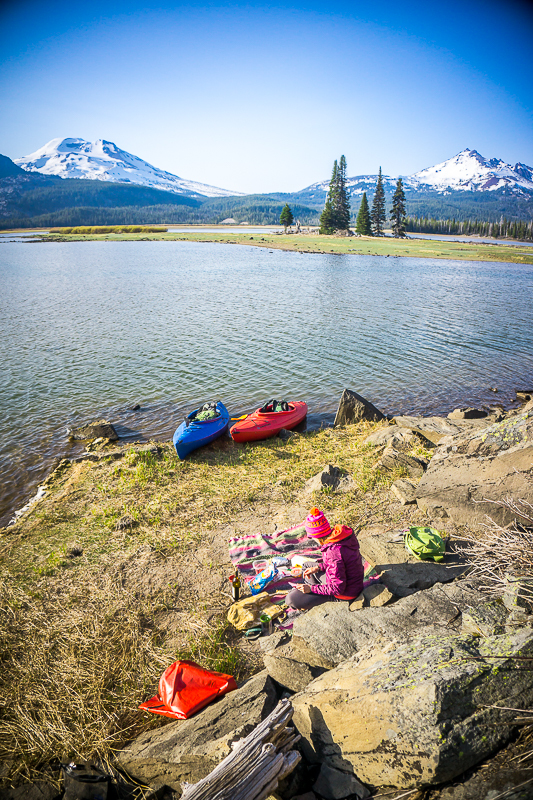 From caving to floating the river to exploring Newberry National Volcanic Monument to scoping out local swimming pools, there are oodles of things for kids to enjoy in Bend. Need ideas? Check out this post featuring 12 things my stepkids rattled off as their favorite Bend attractions, or this post (or this one) featuring family-friendly activities. Then yank the iPods out of their sweaty little hands and get out there to have some fun! Don’t bring your dog there! 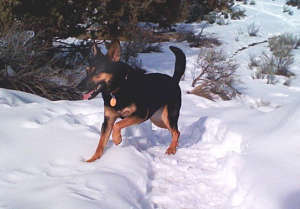 In 2012, Dog Fancy magazine named Bend the nation’s dog-friendliest town. Since that time, the city has only gotten more accessible to your furry friends. From off-leash dog parks (8 and counting!) 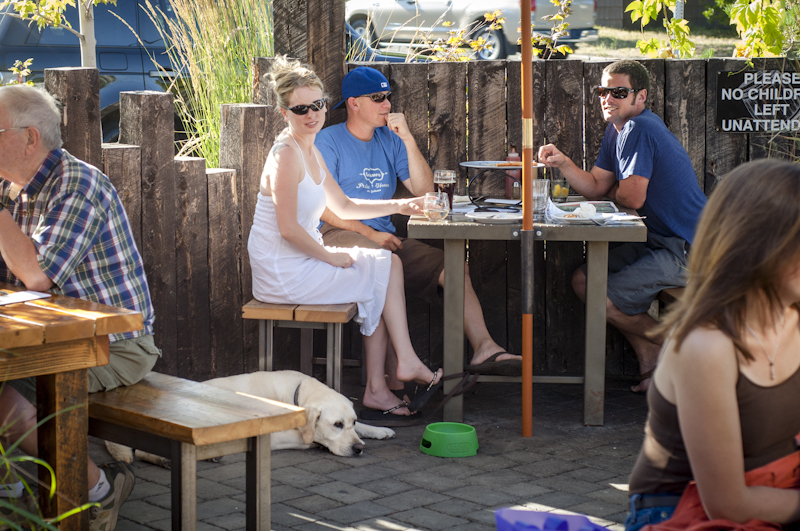 to dog-friendly skiing and snowshoe trails to pet-friendly lodging options to restaurants that let your pooch join you on the patio for a meal, there’s not a whole lot Fido can’t do with you when you’re traveling in Bend. Well, maybe think twice about bringing him into the dressing room at the lingerie store. That’s just weird. I can’t find a beer I like. A few weeks ago I fielded an inquiry from a journalist writing about Bend for a major national publication. Her assignment: To cure herself of a lifelong aversion to beer by journeying to the beer capital of the universe (Bend, Oregon) and sampling her way around the city. The goal would be met if she found a beer she liked enough to consume a whole pint. From hiking to dining, your pooch can join you for most activities in Bend. I don’t want to give away any big spoilers before the article comes out, but suffice it to say, this was one of those moments I really, really loved my job and the opportunity to introduce someone to the wealth of craft beer along the legendary Bend Ale Trail. From porters to IPAs to lagers to radlers to unique beers you’ve probably never even heard of, they’re brewing it up in Bend. Want to plan the ultimate beerventure in Bend? Bend Ale Trail month is coming up in November, with your chance to score a trophy in addition to the prizes you normally earn for gathering passport stamps at the breweries. I haven’t seen a Subaru for ages. Stand on any street corner in Bend. Wait one minute. If you haven’t seen a Subaru drive by, get back in your car and check your GPS, because clearly, you are not in Bend. You really shouldn’t wear that to dinner. I should start by saying that if you feel like putting on a pretty dress or a tie before you head out for a nice dinner at Ariana Restaurant or 900 Wall or Trattoria Spandati or 5 Fusion or one of Bend’s other fine dining establishments, go ahead and rock on with your fancy-pants self. I’ve been known to break out the little black dress myself from time to time. 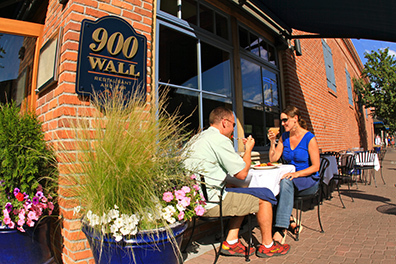 Even the top restaurants in Bend are uber-casual. But it’s not mandatory. You could walk into the nicest restaurant in all of Bend (see the aforementioned list) and no one would bat an eyelash if you were sporting cargo shorts and a clean fleece sweatshirt. It’s that kind of place. Before the last item leads you to the conclusion that Bend’s dining options are limited to a couple of truck stops, let me dispel that myth right away. Yummy taco salad from Salud…gluten-free, vegan, and oh-so-tasty. Bend has such a huge variety of cuisine options that it’s really quite staggering. Looking for Asian cuisine? You can pick between Chinese, Japanese, Middle Eastern, Asian fusion, Thai (both northern and southern) and more. Need gluten-free options? Yep, we’ve got those. How about vegan cuisine? No problem. Unless you’re a cannibal whose hunger can only be sated by dining on the flesh of your mortal enemies, I can pretty much guarantee you’ll find a Bend restaurant that serves your favorite food. There was one day last winter when an early snowstorm collided with freezing temps and a sudden influx of out-of-town visitors, bringing traffic to a standstill in several parts of Bend right around 5:15 on a weekday. I’ll admit it. I got annoyed that my regular 10-minute commute took closer to 30 minutes. 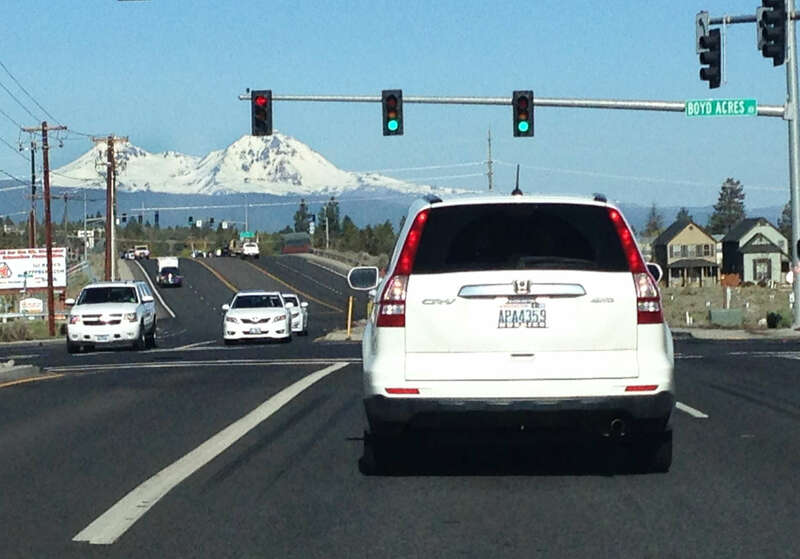 The view from one of the stoplights on the northeast end of Bend. Not too shabby, eh? Then I remembered I’ve lived here for almost 20 years. I can count on one hand the number of times I’ve been stuck in traffic in Bend. Even on our busiest days, I can still get from one end of town to the other in less than 15 minutes. Compare that with traffic jams in places like Portland or Seattle. It’s really no contest. Besides that, the photo over there to the side is my view from the traffic light where I’m routinely stopped on my way to work. Frankly, I’m kinda disappointed when I don’t hit a red light. I’m tired of Bend and I want to go home. My office sits 20 feet from the front desk of the Bend Visitor Center, which sees roughly 200 visitors a day during high season. I’ve worked for Visit Bend for more than five years, and since eavesdropping is one of my most cherished hobbies, I can assure you this phrase has never once been uttered in our building. I can’t speak for the rest of the city limits, but I’ll go out on a limb and say the number of times anyone’s said it is roughly the same as the number of people who can’t find at least one Bend beer they enjoy. I grew up in bend and Powell butte Oregon, until I moved away at the age of 17. I enjoy your articles about Oregon and it’s ecosystem, as it’s exactly how I Remember it. I saw plenty of traffic in Bend when I was there visiting on summer weekend. I’ve been all over this country , lived in many states , this place is Mayberry on steroids! There is no finner place on this planet ! Everyone is happy and appreciating just waking up here everyday . If there are complaints? There not because of this place , that would be a bad attitude for the person itself . Ha! That is an interesting challenge, Caleb. I haven’t actually gone looking, but have you tried Tratoria Sbandati or La Magie? Those two would be my best guesses, but I’ve never looked in either place for cannolis. Let me know if you find some! Coming from the Bay Area I noticed you get slapped with kindness! Bend has the friendliest people. Caleb.. whole foods has them! I miss Demitris, too (though I occasionally see their food cart pop up at events around Bend). While Kebaba and Joolz don’t technically offer Greek food, I do find their Middle Eastern cuisine can be a decent substitute when I get that craving. Bon Appetit! I have never skied in my life nor biked the beautiful trails in Bend. I have not fished the streams nor floated in a kayak but this is still the best place in the world for me. My only regret is that I didn’t discover Bend in my younger years. I am always bragging about these activities to family and friends that do not live here. I love our small town friendliness with big city energy and all the community involvement and adventures around town. Most of all I love our big beautiful blue sky that shines more days a year than in Miami or San Diego. I enjoy the crisp clean air, water, the mountain peaks and beautiful scenery. I love the sound of the many water falls and streams. I love that we truly have four seasons a year. I don’t even mind the snow that falls through the large pines in our back yard at the same time the sun rays dance off the glistening flakes. Beautiful! I also love “Visit Bend” and all your pictures and posts that I share frequently. I LOVE Bend!!! Well said. Loved all these comments especially Pat Haabys. Not many places where you can live and get outside to play year round. The only boring aspect about Bend is having to work while the tourists play. Picked my 23 yr old son up from the airport Tuesday at noon,who is stationed in San Diego in the Marines and returned from 3 yrs. in Okinawa in April, and of course the first thing he had to do at the Redmond airport was take a picture of the mountains on a pure blue sky 43 degree day! His comment was “man the air” and I said “yes it’s cold” then when we got home and he finished packing to go meet his Dad up elk hunting he said it again. I said cold? And he said no it’s so FRESH! lol gotta love Bend!